It’s more than a content marketplace. It’s a library of learning purpose-built to help your employees solve your most critical business problems. Learning content is the lifeblood of L&D (learning and development). So it’s no surprise that 68% of companies rank learning content as a top consideration, coming in second only to leadership development, according to a 2017 study conducted by the Brandon Hall Group (BHG). That level of importance translates into a pretty substantial piece of a typical L&D budget. In fact, BHG found that 36% of companies spend more than one-quarter of their learning budget on content—and they expect to spend even more next year. Regardless of whether you’re building learning content in-house, looking to outsource content development, or both, for that matter, organizations report the quality and effectiveness of corporate learning content is a big problem. In other words, companies are spending big bucks on content—yet they aren’t generating the results the business is looking for. That’s why organizations are seeking out innovation in this area. In fact, according to BHG, 55% of organizations believe microlearning and finding new learning modalities is critical. The reality is, despite the plethora of content marketplaces and vendors building custom content, organizations struggle to find modern content that can effectively tackle even the most common business problems. For example, how to get store associates to use upselling techniques to drive measurable improvement to a sales or DPT metric. These sound simple enough and are pervasive across virtually every retailer and yet, the impact remains elusive for most. To fix the problem, it’s important to understand the solution shouldn’t address just the issue of content creation. We can’t squeeze old content into new technology, nor can we do the reverse. Content and technology play equal roles in modernizing the entire employee learning experience. One of these partners is BizLibrary, a leading provider of online employee training. Modern organizations that are ready to reimagine their L&D content strategy can now benefit from BizLibrary’s award-winning topics, guaranteed to all be axonified. 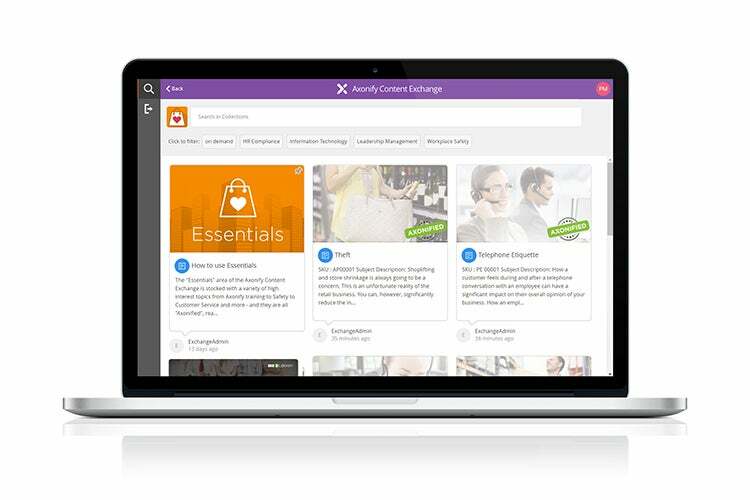 Every topic in our content library is strategically architected using the Axonify Instructional Design Methodology™ (IDM). Basically, this means the creation of the content starts with a clear, measurable business objective. Then, we work backwards to build the entire ecosystem of content that’s necessary to achieve that specific business goal – a strategic training plan, key learning points, behaviors, questions, micro-videos, performance support and more. By starting with the end goal in mind, the micro-topics within the Content Exchange ensure your employees will remember what matters most to elevate your business. But, we’re only scratching the surface here. If you’re interested in learning more about the philosophy behind our new Content Exchange, we’ll be sharing many more details during our upcoming webinar: Wrong Content = Wrong Results: Why the Right Content is Key for Propelling your Business Forward.